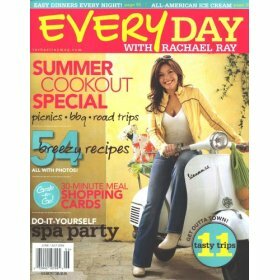 I have noticed recently that many people are discussing Rachael Ray and Paula Deen together. My suspicion is that this is an example of the PR machine at work, since both have new magazines. Other than the obvious stuff that most Food Network chefs have in common (cookbooks, shows, etc. ), I can't think of anything these two have in common. Paula Deen's new magazine is called Cooking with Paula Deen and, in case you have been neglecting your duty to read this blog, Rachael's is called Every Day with Rachael Ray. One recent example of this random pairing can be found in the Birmingham News. You can learn a little bit about both Paula and Rachael by reading this, but does it convince you they have a lot in common? While the Food Network's Paula Deen has legions of fans in this part of the country, she's got some competition in Rachael Ray, whose 30-minute meals have drawn hordes of viewers and landed former noncooks in the kitchen. There are many reasons why both catch the culinary imaginations of viewers. Paula Deen. She's a Southern-fried charmer if there ever were one. She's an old-fashioned cook that many who have lived in this part of the country for years relate to, and of course, she makes things look as easy as apple pie when she whips up her heavy-on-the-butter recipes. She's got such a following that she now has a magazine, published right here in Birmingham. Also, she represents a success story that many viewers understand. She raised two now-grown sons on her own, went from pinching pennies to million-dollar successes, and yes, she found the man of her dreams after all this. Rachael Ray. She's a bubbly, energetic, late-30s newlywed, who has no formal food education, but lots of practical time. She worked in family-owned restaurants, then was behind a candy counter at Macy's. Along the way, she moved to upstate New York, and in between work in restaurants taught classes in 30-minute meals. The Food Network launched her on dining in great cities for "$40 A Day," where her personality garnered fans. Now she's a huge hit with her simple "30-Minute Meals," plus her magazine which began last fall, Every Day with Rachael Ray." She has lots of books out, too. And, like Paula, she was married last year, in Italy to an entertainment attorney. Perfect fit? I would also like to point one more thing out - even though they publish the same amount of issues, Paula's magazine costs almost twice as much as Rachael's!